"There's no substitute for hard work but if you don't work hard you will be substituted for"
Condolences to the entire Winter family. Sam: I know the Bulls organization misses Tex. Because I always hear talk about where do we find another Tex Winter or Johnny Bach. Well, you don't. It doesn't mean things are worse; just different. It's the way life and times are. I'll disagree things aren't better without newspapers, but the next generation adjusts and makes its own way. That's really also the job of the last generation, to get out of the way, appreciate what you had and did and accept that it will always change. Perhaps the values that meant the most to Winter were democracy, which isn't nearly as embraced as we'd like to think. It often was at odds with the Bulls success in the 90s because of the team's superior talent with Michael Jordan. It's what made Phil Jackson so successful. Phil understood individual nature and that it could be merged with democratic principles, that everyone was important; but some more so. Tex would never have been a successful pro coach, and wasn't in his only attempt with Houston and the divisive, but talented Elvin Hayes. It's why Tex was that angel over Phil's shoulder telling him what was right for everyone. Phil needed that because he also knew what the devil had a say and understood elements of both were necessary because they were inevitable in human nature. I always was most taken with Tex's belief in the purity of the spirit. It was why he went to places like Long Beach State and Northwestern despite having an elite reputation. Tex never was concerned with his reputation. He was the ultimate teacher. If students needed help, it never even occurred to Tex his record—and reputation—would suffer. He and Johnny Bach were the most perfect assistant combination in history because Tex believed everyone could be better and didn't recognize status while Johnny endorsed talent and success; the winner of the war was the one who was right. Phil was the ideal fulcrum to balance their Republican poles of thought. There aren't teachers like Tex anymore because the teaching is with computers and spread sheets. It's OK; it's just the next time. There won't be another Tex Winter. Perhaps it's best that way. 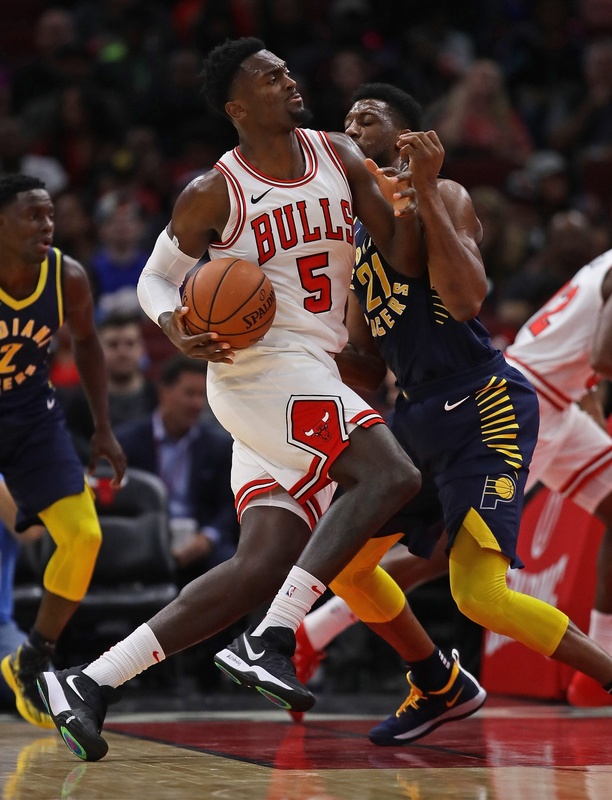 Bobby Portis is a black hole on offense who flexes after scoring when down thirty points and talks about himself in the third person. He also severely injured a teammate! If it were anybody else, I'd label him "arrogant, clueless, and selfish." But I like him a lot, and somehow he seems like a good guy. I sense that people around him do too. What's he like? Sam: That's such a backhanded compliment you must be in traction by now. Bobby really has been a revelation this season, earning his place into the starting lineup, assuming it stays that way until Markkanen returns from injury. Nice timing, too, as he's still eligible for an extension. Bobby has declined to discuss anything about money, by the way. It is a remarkable and encouraging rise for a player who a year ago, as we know, was not only being viewed in some places (other than your keyboard) as a thug for his punch out of Mirotic, but who still had no place in the team's playing rotation. There always seemed someone ahead of him either to showcase or develop or a veteran. His game was scattered with uncertainty between being a banger inside or a shooting outside. His confidence was waning as well as his enthusiasm. He felt he more than anyone—and he did—listened to management about working hard, staying all summer with the team's staff, and getting no reward from all the effort. Yes, he swaggers a bit and sometimes forgets to get back when he's running into the stands to celebrate. But his enthusiasm proves contagious, which this Bulls team needs. And he's been the aggressive player on both sides which the team certainly needs. And he really has long seemed to be one of the more decent people around the team, the guy whom other players always seemed to gravitate to on the road, and whom everyone thanked profusely for telling Dwyane Wade to stick it. There's a lot to root for in this team, but I think the key to this year is Dunn. The frontcourt looks strong with Markkanen, Carter, Portis, and the veteran Lopez. The wings look less settled, but we have a lot to throw at the position – Lavine, Parker, Valentine, Hutchison and the veteran Holliday – and surely something will stick. But point guard seems an all-eggs-in-one-basket proposition with neither certainty nor variety. If Dunn can't deliver, it doesn't seem like the team has any other options. So, with 80 percent of the preseason finished up, what are you seeing? Can Dunn be a top 25 percent point guard? What's his ceiling, and what's his floor? I'm hoping for a great season and a playoff run, but I imagine, if this season brings another lottery pick, it will be earmarked for the point. Sam: I'm still uncertain about Dunn, though you are correct that his development will go a long way to determining how far the team advances. I think there's little doubt Dunn will be a good player. But point guard is vital in this era, and there are so many great and near greats. Just being good may not be good enough. With his long armed, limber approach, his defense should remain consistent. It's not great quite yet, but can be. Offensively where everyone has been watching, he's been cautious, admitting he's been more concerned with distributing. His shot has looked better, though mostly at a standstill. I haven't really seen him make shots off the dribble. He's finished better, but doesn't try to very often. We're still all waiting to see if he can be a dynamic two-way player. 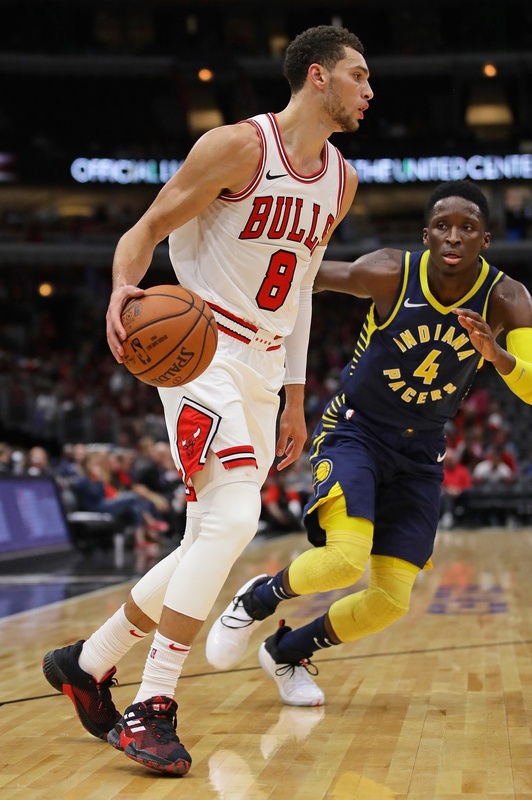 If he can be, the Bulls may really have something going once Markkanen returns. I have been hearing and reading Bulls faithful talking about this being a 40 win team and sneaking in to the playoffs.. crazy talk !! The way this Bulls team is built, in the 2nd year of a rebuild is at best a 32 win team. I wish people would just appreciate this team for what it is, a rebuilding team hoping to see growth from its core of Markkannen, Dunn and Lavine whilst having cap flexibility to go after a free agent next year to speed up the rebuild. This team isn't competing for a championship in the next few years and as much as i love the home town kid story with Jabari there is a reason the Bulls signed him to a 1 year deal with a option for the second. Enjoy the journey, it's going to be frustrating at times and exciting at others, but this team is rebuilding, not built for a deep playoff run. Hopefully that happens sooner than later, but its not this season. Sam: If you dare call us the colonies, we won't accept another whilst. And where do you get off promoting reason in my mail? You know that first game got everyone excited until the next two sent everyone into despair. It is why we love these games. Being a fan means not having to say you don't have hope. Before Markkanen was hurt and before Parker came out slowly, one could dream: Young players, athletes, space, East, pace, yadda, yadda, yadda. Reality has mostly set in with the realization Markkanen is probably out until Thanksgiving, Parker isn't in yet, Holiday probably went from 11th man to fifth man, Lopez left his giddyap somewhere and a 19-year-old looks like the best big man. But it's way better than it was. LaVine looks great, Portis is much improved, Dunn is stabilizing and there's a foundation. A 13-win improvement from 27 is a lot. But they do have a chance to beat your over/under. I knew this season would be an 'uphill battle'. Didn't realize they'd have to climb out of an abyss first. This sure is a(nother) challenging year for Fred, but also one of opportunity. This starting out as such a disorganized mess (at 1-2) that turning it into the semblance of a team will seem like a miracle. By season's end, Fred will either look like a genius.. or get fired. Zach really did look good! That's the Zach LaVine I'd seen before and was very happy to acquire. At least on offense, he makes the game look easy. Jabari seems to be the exact opposite. I liked his effort better in this game, but everything he does looks difficult. He runs the floor like an old guy and gets up, but only with significant effort. And what happened to his shot? Jabari looks like he didn't shoot a J or run a sprint all summer. Actually, I'm hoping that's it, because that means he'll get better in a month or two. Sam: The take of two citizens? It's been an awful debut for Parker, which is why I was surprised at his summer's press conference when he was so angry and defensive about questions regarding his health. He signed the deal already. Set the expectations low so you can surprise. I understand the pride of an athlete, and I'm sure Parker was tired of two years of doubts ad questions. It probably wasn't great for him that he worked out at small forward and then had to be a power forward with Markkanen out as much as he diminished the notion the positions weren't different. Maybe to his credit he wasn't seeking excuses, though he could use some now. I'm still going with recovery from ACL squared. Like LaVine said after the Indiana win, it takes a lot longer to recover than you think and you still have your bad days. I'm willing to give Parker more time. I don't understand why Jabari is coming off the bench after a couple preseason games. I think Holiday should be coming off the bench. Holiday is pretty much a backup talent. He's not that much better at defense than Parker yeah he gets steal and runs, but he's not a finisher. He's no threat to drive to the basket. We've seen Holiday the last few years, he doesn't impact the game much. A lot of empty stats. Jabari has moves he can drive, I think you got to give him a chance. Sam: Well, now it's four preseason games! Isn't that enough of a sample? Heck, it's almost mid-October. That is the great part of sports and the difficulty. By All-Star weekend no one will remember any of the preseason games. But we're already willing to make a judgment a week before the first game of the season? It's part of the new media, instant analysis era, and too bad. You get a picture like that on your TV, well, everyone can see more clearly now what you are doing. Jabari will get a chance and I suspect he'll play as much as Holiday. If Parker plays well, he'll finish games, and isn't this what we've always asked of Hoiberg: Judge the players by result and not reputation. Holiday is, I agree, more suited over a long stretch to be a reserve. But thus far he's shown much better than Parker, defended better, moved more quickly and fit more precisely. Parker has made some pass plays off the dribble and rebounded reasonably well. Being new, sure, he needs to learn the other players, whom Holiday generally knows. Parker since returning from injury, and in Milwaukee as well, has not shown the game he had before his second ACL. You can be sure the Bulls would love to see that. I'm not worried, what with it only being three games into the pre-season, but what do you think is most important for the Bulls this season? Obviously staying healthy is of major importance, but do they need to make the playoffs? It's a possibility in a much more open eastern conference but we'll see if it happens. So what would be most important for you? Further improvement of the LaVine/Dunn partnership, consistency, improvement of the rookies or something else? Should be an interesting season. Sam: I agree the development part should make the season much more compelling with more chance to judge the potential. Last season it was more to judge the potential of most everyone's trade value. As I mentioned above, Dunn's development as a true point guard is essential. I still don't see a true backup point guard, though auditions continue. Of course, Markkanen's development is delayed, and thus the fit. So, yes, it's difficult to project too much optimism. Many in the organization believe Markannen is the best talent. Any team loses its best player is not going to have the same season. I doubt LaVine agrees with that assessment, but even losing your second best. And can Wendell Carter really be a starting center? Most opposing centers are taller. He's not the super athlete. But he hustles and seems to know how to make plays. He'll be in a lot of foul trouble since when officials aren't sure they make the call against a rookie. That will go on until probably March. 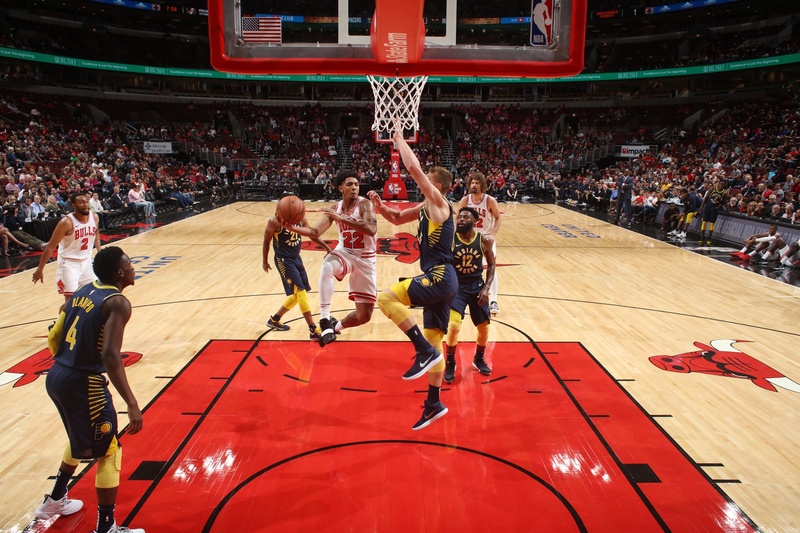 I don't believe the Bulls need to make the playoffs, though remaining competitive and in theoretical contention through March would be advisable. I've been having fun arguing with other fans that the Timberwolves should have known what they were getting themselves into with Jimmy Butler. He seemed like a guy who would eventually pull this kind of thing during his last two or three years in Chicago and it wasn't a big secret. Do you think Bucks fans and followers will be saying the same thing to Bulls fans soon about Jabari Parker? I didn't follow the situation all that closely, but I think he got quite upset and became a distraction late last year when he came back from injury and wasn't used as much as he hoped to be. Might this year's Bulls team have the same sort of problem? Sam: Jabari is no Jimmy Butler. Which is good and bad. I don't see Jabari having those meltdowns, which Butler had more times in Chicago than most realized. Of course, if Parker were to develop like Butler did, I doubt there would be many complaints about the occasional combustion. Parker's connected to Chicago and community activities, so I expect him to be professional. He's gotten off to a rocky start with media, though I attribute that more to the anxiety of trying to show he's more than the Bucks believed and the injuries suggested. He doesn't reveal much, but with four high school titles and Duke freshman records—but without much post season—it's obviously been discouraging for him to have so many physical setbacks. It remains to be seen, and he clearly isn't on board yet with being a reserve, if it comes to that. It seems like it should for now as the team functioned the best it has all preseason with he and Lopez off the bench. Starting isn't and shouldn't be given; it should be earned, and especially for a new player on a one-year contract joining a team of young players. You want to start? Go and outplay Portis or Holiday. So far Parker hasn't, so he should not start. He'll get plenty of playing time, and it seems to me Hoiberg goes to great lengths—greater than for most—to try to put Parker in position to make more plays by drawing up options for Parker to dribble up. It's up to Parker to produce. After all, he was paid in advance. Sam: Perhaps my sentimental journey? I disagree. I've long thought Doug is someone who just tried to please too much, and thus was caught in this revolving door of uncertainty with the Bulls changing coaches and style and then part of deals to multiple teams. The $22 million/3 years is a great deal for the Pacers in this era, I believe, to get a shooter with that potential. 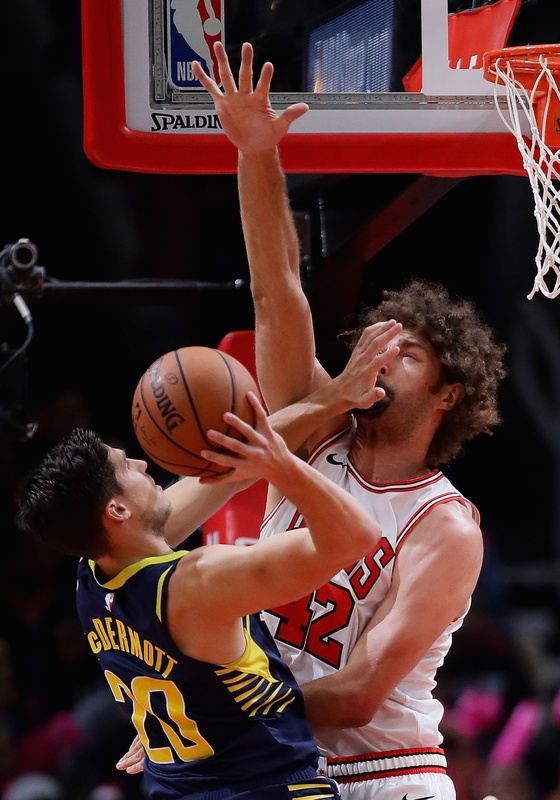 Indiana longtime has been one of the best and most stable franchises when they didn't have Ron Artest, and I believe Doug will prosper there in much the way Kyle Korver, basically given up on by Chicago fans as a playoff choker, became a starting All-Star and one of the league's more valuable players. As good as Jimmy is, I think you have to be concerned about the impact he is going to have in the locker room, on your younger guys, on your coaching staff, all of that. He has gotten the benefit of the doubt, but if you look at his history, he's had trouble getting along in Chicago and now in Minnesota. "Everywhere he goes, it becomes about Jimmy, and if you're going to bring him in, you have to account for that." Fair or not? Typical of superstars, or superstar wannabes? Sam: Ah, the Jimmy Chronicles. "Jimmy's under the boards. Jimmy's in the open. Jimmy makes the shot. Jimmy's down!" What a week it has been for The Jimmy. Jimmy doesn't like misunderstanding. Jimmy and misunderstanding kind of clash. I believe that's a fairly common belief around the NBA now, though if they can get a good deal I suspect 27 or so teams would gladly welcome Jimmy. Which is Jimmy's problem now, and the problem he created, in part. His latest outburst sent a message around the league that this guy may be trouble, somewhere between Rodman and Stephen Jackson, close to Hall of Fame talent and also Close to Hell locker room. With all the verbiage about truth and justice and toughness and work—did Jimmy mention how hard he works?—this, predictably, is basically about money. Jimmy wants a max five-year deal. The Timberwolves said, 'Nah, you're going on 30, been hurt. We're going with the 22-year-olds.' That's it. Not really to do with winning and teammates and competition. Of course, everyone wants to do well and succeed. But Jimmy's just doing what everyone before him has done, though not quite the same way, which also defines the guy who came from 30th in the draft. It's actually also a quietly major issue in sports. The analytics people who run teams these days have basically figured out it's more cost efficient to pay young stars and not veteran free agents. Sure, you pay LeBron, Durant, the super guys. We saw it in baseball last winter. If the guy doesn't move the needle in a big way, and Jimmy doesn't given a career playoff record below .500, teams have decided it's better to invest in potential stars. Maybe they'll be great. We know these guys are only very good. Jimmy, unsurprisingly, hasn't taken it very well. So he brought his ESPN cameras and staged his drama in Minneapolis Wednesday and then skipped the team's trip to Milwaukee Thursday. Jimmy's no dummy. Put a little more pressure on the Timberwolves. See if he can humiliate their core players. He needs his Bird rights in a trade to get max. As a free agent, he gets four years, not five. So he's not playing it out as his contract suggests he should. Jimmy's life has been a lot of risk taking, con game, daring and self assurance, from finding places to sleep and eat to a school that would take him to a coach who would play him. He's climbed to the top of the sports world to the point he's insulted by a $100 million contract offer. C'mon, that is pretty cool if he can pull it off. What has gotten into Jimmy? What happened to "just a kid from Tomball Texas?" I'm very disappointed to here about his awful attitude. Sam: You'd think by just looking at the map Minnesota has enough scorched earth. And then came Jimmy. It's difficult to get into a discussion with someone who's always yelling. But before we accept this notion that Karl-Anthony Towns is a loser and Jimmy's a winner, remember Towns led his team to a state title as a high school freshman and went to the Final Four with Kentucky and was the most productive player on his loaded team. Jimmy's Marquette teams never went beyond the Sweet 16 and with other NBA players and never were better than fifth in conference. When Jimmy became the man for the Bulls after Derrick Rose was traded, the Bulls were a .500 team and then in the playoffs lost four straight after Rajon Rondo was hurt. 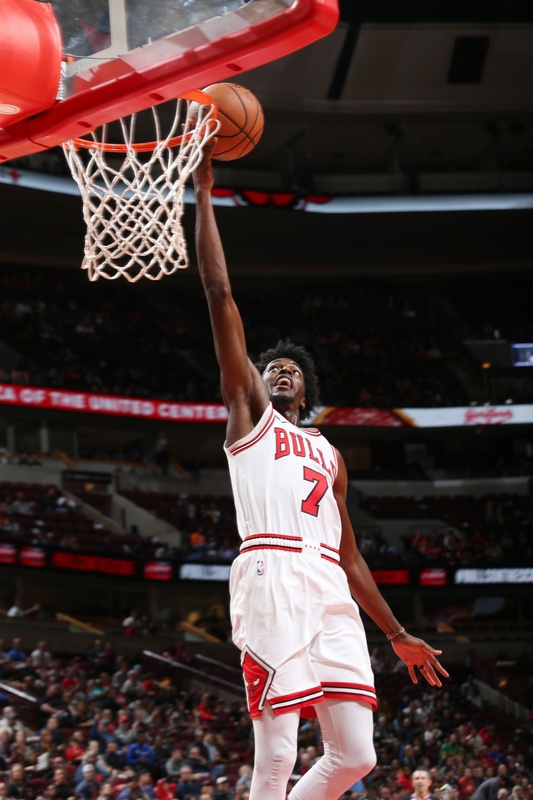 Jimmy collapsed in the final two games, attempting a total of six free throws in two games, which didn't define much effort. He resented Rose getting the attention, and then Rose leaves and now they credit Rondo? C'mon! 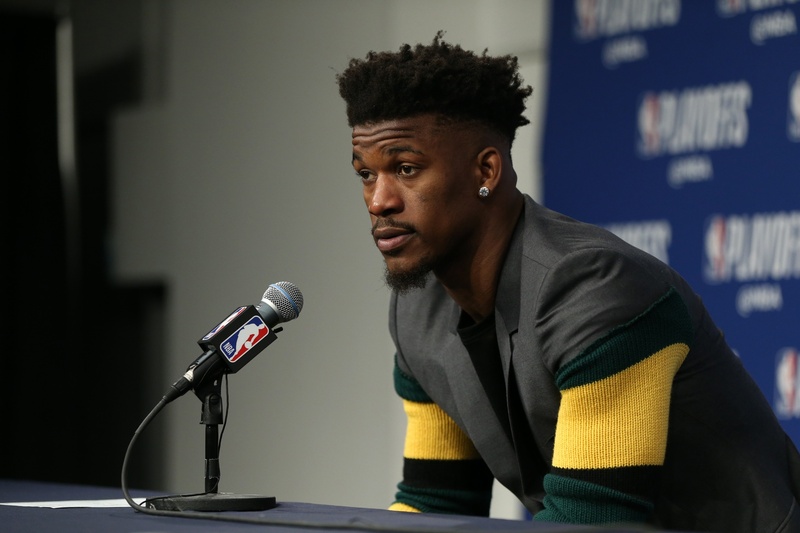 Jimmy's been upset the Timberwolves committed to Towns over him, and it's not unusual and to many not inappropriate. After all, Jimmy's been an all-pro. Towns is not nearly as celebrated, though more so than Jimmy at his age. But that's also life. Towns is at the right time in the right place in the right era. Jimmy already has rejected a contract larger than Michael Jordan basically ever was offered. Towns has been remarkably unruffled over all this, to his credit. Though not surprising for a kid with a 3.96 GPA in high school. It's a shame Towns has to be the target. He doesn't deserve that and could easily point to records and ask Jimmy what he's ever won. Jimmy's a terrific player and the Timberwolves certainly were better with him. Jimmy often does things louder than others, but he's always got a good reason, at least to him. He's looking for a way out to maximize his future earnings, which it apparently became clear the Timberwolves were not going to do. It's something many others do; just not often this way. And by the way, how would this Minnesota starting lineup look: Dunn, LaVine, Wiggins, Markkanen, Towns? No, you don't let coaches run your organization. There have been reports that Fred is installing a "switching defense" that some other teams have adopted. 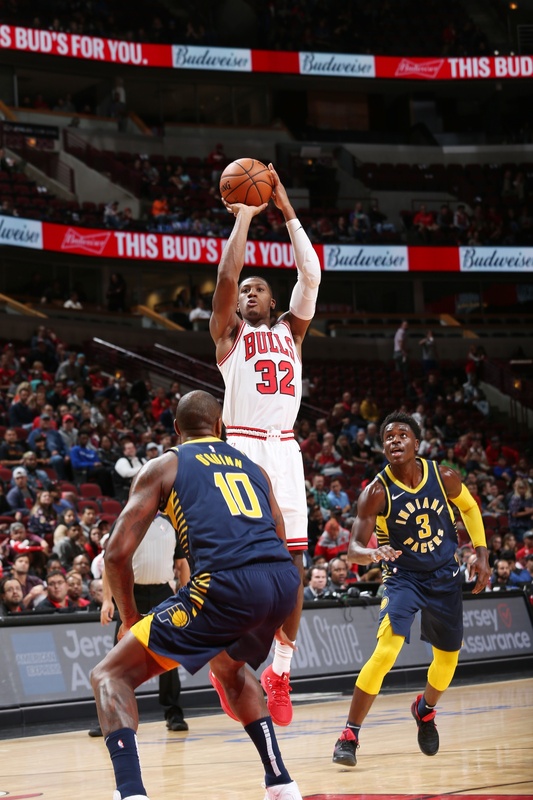 What is a switching defense and how does it differ from what the Bulls have been using? Sam: It's not that much different since the Bulls used a lot of switching last season. Essentially, it is a lazy man's defense. It's like a zone where you sort of stay in one area and as the players hand off or go behind screens you stay with the player coming into your zone. The theory is that since most teams in the NBA play pick and roll offense, switching can negate the advantage of a pick and roll. That's because after a screen or pick, if you are the defender the man you are guarding is often open for a shot past the screen. The problem with most switching systems is few teams have five equal defenders. Meaning teams can identify a weak or small defender and then knowing they will switch can get that weaker defender on a bigger or faster player. I personally believe switching makes defenders lazy, which is what is considered my old time thinking. Teams always used to play man to man. You guarded your man wherever he went. If he got a shot, it was your fault. So get there! Now guys can say too easily it was everyone's fault. Though if you have five (or four like Golden State) defenders who are aggressive and can switch and close in height, you can play an excellent defense. Actually, the Bulls played versions of that when Toni Kukoc substituted for Luc Longey in the 1996-1998 championships with Rodman at center. That was a great defense that switched. There aren't many. The Bulls did it mostly with perimeter defenders last season, but this season, and especially with Carter, are trying to do it more often. They believe it will make them a better defensive team. And with the additions of Carter and Portis to the lineup Wednesday, they were much better and more capable of switching. So maybe it will work out. We'll be watching. I'm really concerned with Cameron Payne being the back up point guard. He's ineffective as a playmaker and I don't believe he has the necessary IQ to run the second unit. I was hoping for a veteran back up point guard signing , but at this point I'd be more comfortable with Arcidiacono as he is more effective in Hoiberg's system, more physical and a better defender. Also, in a half court set, the offense struggles with this ineffective passing for 10 seconds without putting any pressure on the defense. It's too mechanical and predictable. I'm all about sharing the ball, but don't you think they are better off with LaVine or Dunn trying to penetrate first and then move the ball as the defense collapses ?? Sam: Payne went into camp as the presumed backup, but if earning your spot is still active, I believe things can change. I think Arcidiacono needs to shoot more since he can, but I do like his toughness. I wouldn't leave him out of the discussions the way things are going. The Bulls have been talking about, as you notice as an issue, getting more penetration instead of all those perimeter handoffs. It was a main tenet of Tex Winter's, penetrate with the ball, the pass or the dribble to start a possession. Hoiberg has talked about it more this training camp than I have heard before, so maybe with in theory more playmakers we will start to see more of it. Sam: We haven't seen much of any of them. 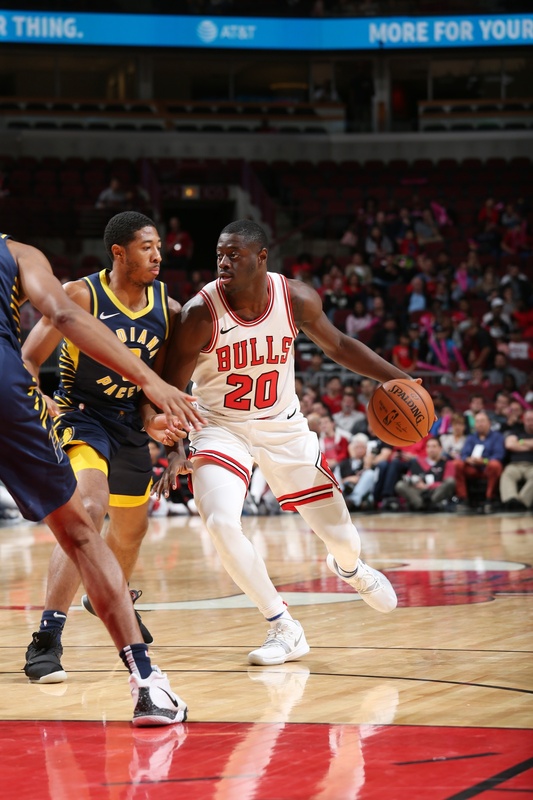 Alkins has the one two-way so far of the two possible, and I think he'll be interesting to see at Windy City. From what I heard about camp, the guards Walton and Cleveland were the most impressive of the free agents. I assume Arcidiacono makes the roster. I expect most of the rest will be with Windy City. Rumor has it that KD might leave the Warriors. Do you see the Bulls reach out to him? Big market, he'd be the man here and in a weaker East conference with an improved young squad around him... The opportunity of proving he can win without nothing but All Stars around him might be appealing to him, no? Sam: Well, that sure would answer the the hole at small forward. Of course, it probably would for every other team in the league, also. If it were me, I'd never leave the Warriors. That team with basically everyone in their prime could win the next five titles. They've moving into what probably will be the best arena in sports in a city where if you are very rich it may be the best place to live. I'm told all the players are. But you hear speculation. 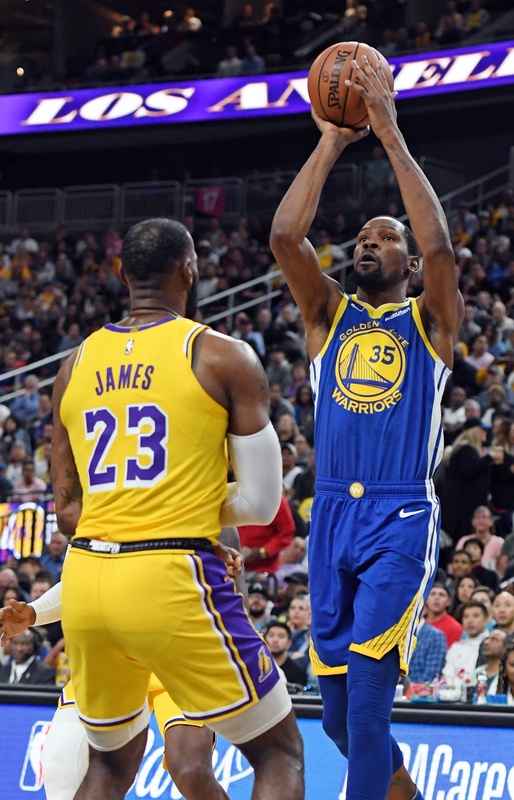 The latest is Durant intends to join LeBron with the Lakers next season to put an end to the Warriors dynasty. I'm not sure if Ray Allen is advising him. Some suggest the East, where the path is easier, and the Bulls have some very good players with one position really open. Of course, the Knicks supposedly are saving their money—again—and DC is home, and, well, at least we're going to have another fun July. Why does Bill Wennington currently shave his head? What razor and shaving cream does Bill Wennington use to shave his head? 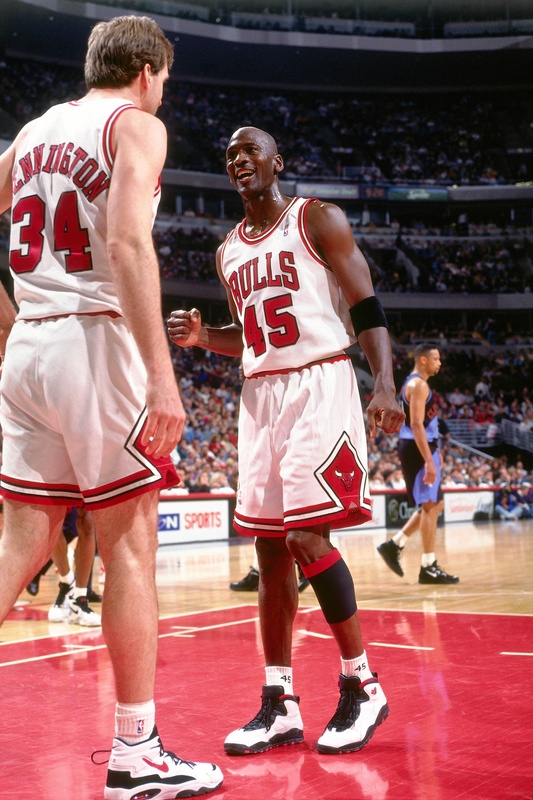 Also, during the tail end of his career of playing in the NBA; why did Bill Wennington get a Buzzcut haircut? Sam: Because if you AskSam you learn, I was able to obtain an exclusive interview with Bill Wennington. Here is an unedited transcript: "I currently shave my head because my hair does not grow on top...oh, wait; cause I want to be like Mike, yeah yeah, thats it. I use a Gillette Mach3. Oh no, no, that's not it. I use a bug knife that I sharpen daily like Crocodile Dundee did. I use regular soap ( Dial ) in the shower to shave, or what ever shaving cream Anne (wife) or Rob (son) get me for birthdays or Christmas. End of my career I started to get buzz cuts for two reasons. First, they are very easy to take care of, low maintenance. Second, I knew my hair was thinning on top and I was getting ready to cut it off...no wait; it's because I am so freaking handsome I knew that no matter what I did I would still be gorgeous and I was proving a point..yeah, that's it."